You’ve got a brand new Mac. Congratulations! But all of your files and applications are still on your old Mac. Here’s how to migrate them in just a few clicks. You might be reaching for an external hard drive, and and that’s not a bad idea, but there’s an easier way. Your Mac’s built-in Migration Assistant grabs your documents, applications, and system settings from one Mac and puts them on another. It takes a while to run, but it’s insanely easy, and the results are well worth it. Overnight, your new Mac will feel just like your old one…only newer. 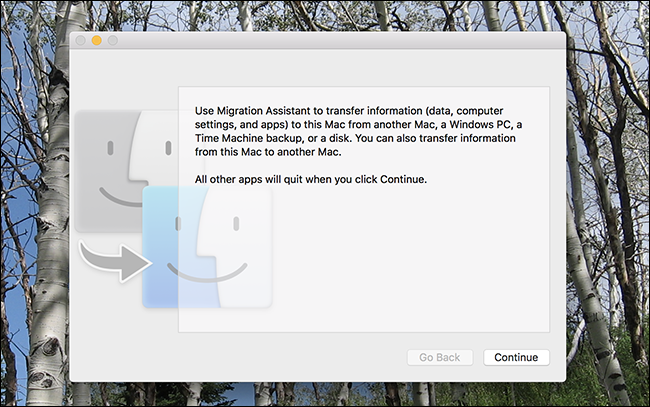 Migration Assistant can pull data directly from your old Mac or from a Time Machine drive. 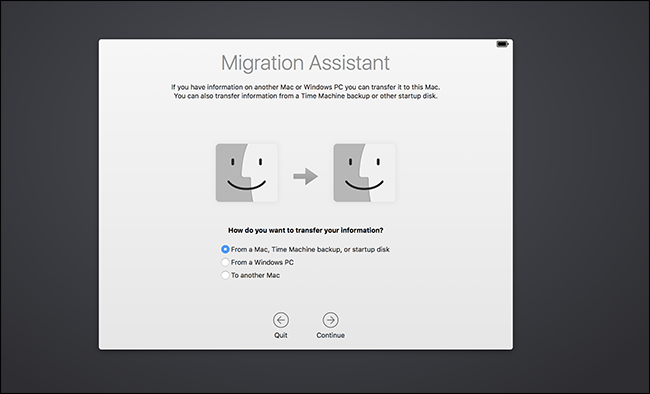 You’ll be offered the chance to use Migration Assistant when you first turn on your new Mac, during the initial setup wizard. If you’re like me, though, you didn’t start the transfer right away, because you wanted to play around with your new computer a bit before waiting for a massive file transfer to finish. 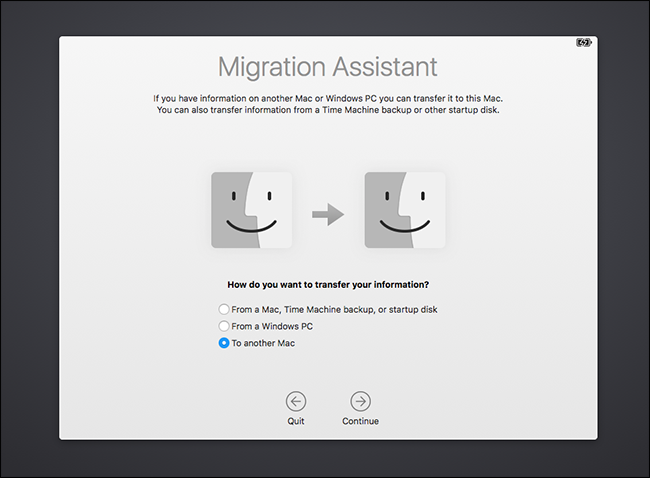 No matter: you can launch Migration Assistant on your new Mac at any time. First, plug your Mac into the power supply: this is going to take a while, and you don’t want your battery dying halfway through. Then, in the Finder, head to Applications > Utilities. You’ll find Migration Assistant there. Click “Continue” and your current user account will log out. Eventually you’ll see the first window of the process. Click the “From a Mac, Time Machine, or Startup Disk,” the click “Continue.” Now let’s get your old Mac ready. If you have a Time Machine backup to restore from, you don’t actually need your old Mac at all: just plug the drive in, or connect to it over the network, and continue to the next step. 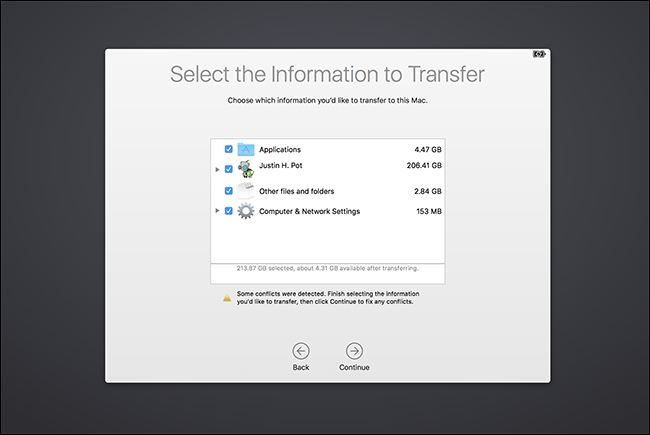 Migrate data directly from one Mac to another Mac over your network. This is the simplest, though slower, method. However you decide to connect your Macs, make sure your old Mac is plugged into the wall using its power supply. Next, start Migration Utility on your old Mac, which again can be found in Applications > Utilities. When the program launches, click “Continue” and your old Mac will log out of the current account. 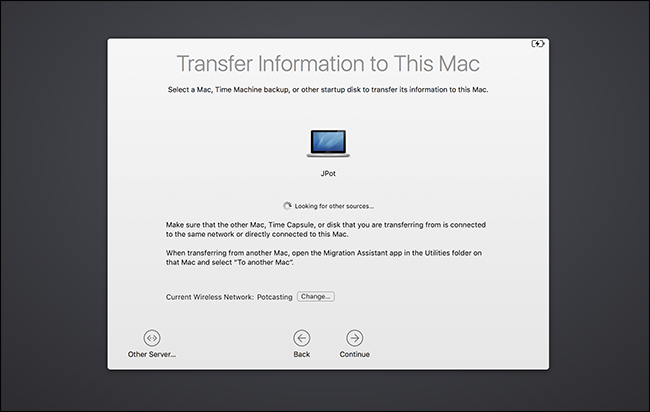 Select “to another Mac,” then click “Continue.” Now you’re ready to head back to your new Mac. Back on your new Mac, you should see a list of devices you can restore from. As you can see, I’m restoring from another MacBook, but if you have a Time Machine drive, you should see it here as well. If you have a networked drive that’s not showing up, you can connect to it directly using the “Other Server” button at bottom left. 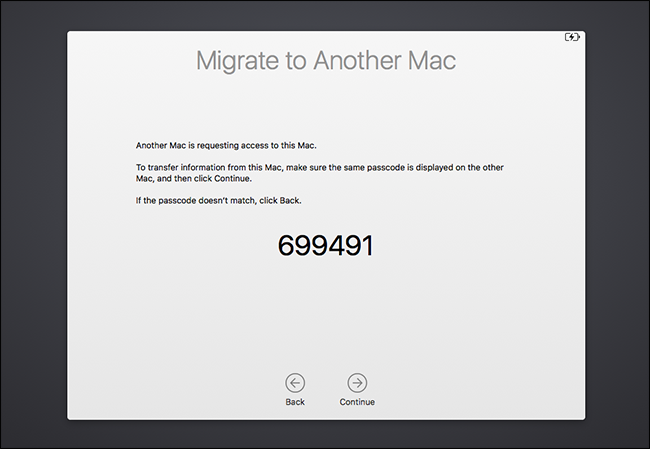 Select what you want to migrate from, then click “Continue.” You will then be asked to confirm that the same number is showing up on both Macs, which you will need to confirm on the old Mac. Once you’re past the numbers, you’ll see a list of things you can migrate. You can choose which user accounts you’d like to keep, whether you’d like to port over all of your applications, and whether you’d like to keep you system settings and other files. Uncheck anything you don’t want, then click “Continue” to begin the migration process. Depending on how many files you’re moving, this might take a while. Mine took about six hours; yours might take even longer. I suggest you let it run overnight. When the process is done, you can log into your old accounts on your new Mac, and you’ll find everything just where you left it. Your documents and applications will be in the same spot, and your wallpaper and the way you’ve arranged your dock icons will even be identical. It’s very complete. Most applications migrated from one Mac to another work just the way they did before: even your custom settings should make it over. Any applications you bought or downloaded from the Mac App Store will work, though you may need to enter your Apple ID again the first time you launch them. Commercial applications installed outside the Mac App Store, like Microsoft Office, will make the jump from one Mac to another, but you’ll probably need to re-activate them. Dig up your product codes and launch them all on your new, just to make sure. Note that, in some cases, you may need to de-activate commercial software on your old Mac before activating it on your new Mac. Other than these notes, the whole process is surprisingly wholesale. My documents, apps, and settings all made it over from one Mac to the next. I was pleasantly surprised to find all the applications I installed with Homebrew made it to my new Mac, something I completely did not expect. I did need to re-install the command line tools to use Homebrew again, but still: everything else made it over. Get comfortable on your new Mac, and spend some time making sure that everything is there. Once you’re comfortable that you’ve got it all, you can wipe your old Mac and re-install macOS before giving that Mac away or selling it.